The televised Christmas Day Mass for the Homebound with Bishop Frank J. Dewane as Celebrant will air for a full hour on Christmas Day. For viewers in the northern portions of the Diocese (DeSoto, Hardee, Highlands, Manatee, and Sarasota counties), the Mass airs at 9:30 a.m. on the CW Network. In the southern portions of the Diocese (Charlotte, Collier, Glades, Hendry, Lee counties), the Mass airs at 8:00 a.m. on WFTX-TV (FOX-4). Please check your cable provider for channel listings. Leaflet missals are available upon request by calling 941-486-4714 or by writing: TV Mass, Diocese of Venice, 1000 Pinebrook Road, Venice, FL 34285. For more information, contact Gail Ardy at 941-486-4714 or email ardy@dioceseofvenice.org. Catholic Charities launches the annual Christmas Appeal during December 2018 and January 2019. The goal is to raise $565,000 and your gifts are much appreciated! The Catholic Charities Christmas Appeal is the agency’s largest fundraiser and critical to operating the social service organization. Your donation will benefit Catholic Charities programs and services available throughout Southwest Florida that assist individuals, families, and seniors all year long. Thank you for your giving spirit! 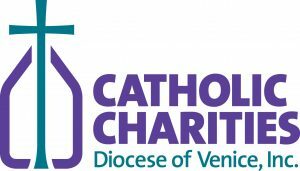 To donate please visit www.catholiccharitiesdov.org or mail a donation to Catholic Charities, Diocese of Venice, Inc., 5824 Bee Ridge Road, PMB #409, Sarasota, FL 34233-5065. For more information, please call 941-488-5581. 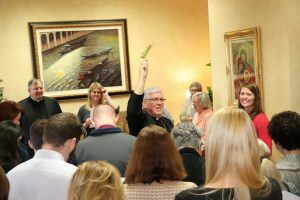 During the first week of Advent, Bishop Frank J. Dewane blessed the Catholic Center Christmas Tree Dec. 6 during a prayer service with the employees of the Catholic Center in Venice. The tree was then decorated and various holiday treats were offered. Following the Filipino tradition, several parishes have hosted all or part of the so-called Mass at Dawn (Simbang Gabi). This novena of Masses in celebrated preparation for Christmas. In the Diocese, the full novena was available at St. Maximilian Kolbe Parish in Port Charlotte and began Dec. 15. Three Diocesan Filipino priests celebrated the opening Mass. 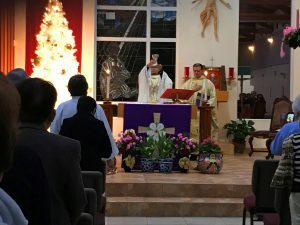 Additional one-day Simbang Gabi or Misa de Gallo opportunities took place Dec. 16 at Incarnation Parish in Sarasota and St. Andrew Parish in Cape Coral, as well as Dec. 21 at St. Leo the Great Parish in Bonita Springs. Although this tradition is not exclusive to Filipinos, its observance is very much highlighted and distinctive of the Philippine Catholic culture. Bishop Frank J. Dewane invites everyone to participate in the Annual Mass celebrating Haitian Independence at 2 p.m., New Year’s Day, at St. Leo the Great Parish, 28290 Beaumont Road, Bonita Springs. The Mass, which is on the Solemnity of Mary, the Holy Mother of God, brings together the various Haitian communities within the Diocese of Venice for one celebration. Most Rev. Désinord Jean, Diocese of Hinche, Haiti, will be the Principal Celebrant and Homilist. There is a reception after the Mass in the Parish Hall. Are you longing for a deeper relationship with Jesus? If so, the “Lord Teach Me To Pray” prayer series rooted in Ignatian spirituality is for you. The first part of the three-part series, “Praying Christian Virtues,” is being offered for women for 12 weeks beginning Tuesday, January 8, at St. Thomas More Parish, 2506 Gulf Gate Drive, Sarasota. For more details, please email Veronica at veroltmtp@gmail.com. All are invited to Our Lady of Perpetual Help Retreat Center at 1 p.m. Jan 12, 3989 South Moon Drive, Venice, for an afternoon of fashion, food and fun. Registration begins at 12:30 p.m. with an opportunity to bid on auction items. Lunch will be a Caesar Salad with your choice of salmon of chicken. Great Christmas gift! For more information or to buy tickets please visit www.olph-retreat.org or call 941-486-0233 ext. 3002. The Office of Family Life is hosting two Parenting workshops. Catholic Parenting is challenging! Learn specific tips and tricks that helped hundreds of families thrive! Jim and Maureen Otremba have been presenting for over 20 years and have given presentations to Parishes and Diocese around the country. The workshops are 6 p.m., Jan. 15 at Our Lady of Light Parish, 19680 Cypress View Drive, Fort Myers, and from 6 p.m. Jan. 17 at Our Lady of the Angels Parish, 12905 E. State Road 70, Lakewood Ranch. The cost is $25 for materials. Registration is needed. Pizza dinner and drinks will be provided. Our Lady of the Angels will have babysitting available. For more information and registration go to www.dioceseofvenice.org/calendar. The Office of Family Life is hosting a workshop at 1 p.m., Jan. 16, at St. William Parish Ministry Hall, 750 Seagate Drive, Naples. The Universal Call to Holiness invites us to “the fullness of the Christian life and the perfection of charity” (Lumen Gentium). For Catholics in their retirement years, this invitation takes on new joys and challenges as their wisdom increases and defining life characteristics such as career, mobility, and relationships undergo transition. This workshop provides strategies for retired Catholics to enrich their identity as cherished members of the Body of Christ. Rooted in our baptismal call to holiness and drawing on the riches of the Eucharist, the presentation incorporates current research on brain biology, generativity, and wellness. Participants will gain an enhanced knowledge of the gift they are to the Body of Christ along with ways to share their gifts with their faith community. Suggested donation at the door. Please register by Jan. 14 either online at www.dioceseofvenice.org/calendar or call St. William at 239-261-4883. Faith and Ale is an outreach for men to learn more about their faith and grow closer to Our Lord. The next gathering is 6:00 p.m. Thursday, January 17, at Our Lady of Light Parish, 19680 Cypress View Drive, Fort Myers. The speaker is David Casper, a retired Hall of Fame American football player. Locations will vary throughout the 2018-19 season. To register, or for more information, please visit www.faithandale.com. St. Agnes Catholic Church, 7775 Vanderbilt Beach Road, Naples will celebrate a Blue Mass in honor of Law Enforcement and First Responders, Active and Retired on Saturday, January 26, 2019 at 11:00 a.m. This year’s guest homilist will be Deacon Bob Montelongo of the Chicago Police Department. Please join us as we honor their sacrifice and service to our community. A luncheon will immediately follow in the Parish Hall. Please RSVP at 239-592-1949 for the reception. This is the new Lady Cougar Weightlifting Team at Cardinal Mooney Catholic High School in Sarasota. 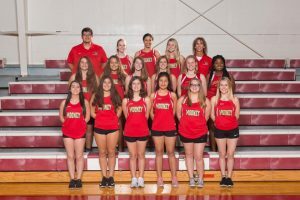 The Cardinal Mooney Catholic High School Lady Cougar Weightlifting Team made its debut in November. This new Sarasota team consists of 15 inaugural participants and will be competing against teams at competitions throughout the region. 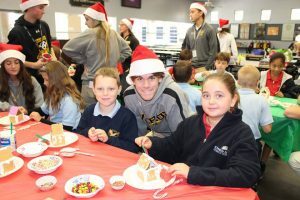 Bishop Verot Catholic High School National Honors Society members hosted a gingerbread house decorating Dec. 6 in Fort Myers for second and third grade students from St. Francis Xavier Catholic School in Fort Myers and St. Andrew Catholic School in Cape Coral. The Bishop Verot Catholic High School National Honor Society welcomed second and third graders to the Fort Myers campus Dec. 6 from St. Andrew Catholic School in Cape Coral and St. Francis Xavier Catholic School in Fort Myers. It was a fun day of creating beautiful Gingerbread Houses and Christmas Cookies, and a little snacking too. Epiphany Cathedral Catholic School students from Venice played Christmas music in early December at Sarasota-Bradenton International Airport. 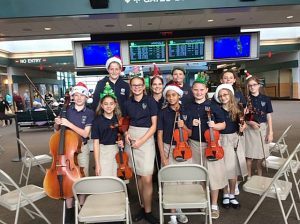 String musicians from Epiphany Cathedral Catholic School in Venice entertained weary travelers at Sarasota-Bradenton International Airport on Dec. 4 with a holiday concert. Musicians from Cardinal Mooney Catholic High School in Sarasota also had their own holiday concert a few days later. Great job everyone.